Provenance Gallery is pleased to present Three Hail Marys, Two Our Fathers, an installation featuring the work of Lisette Chavez. Opening on July 9, and will be on view until July 23. Bored in weekly sermons and trips to holy sanctuaries, Chavez often found herself distracted by over- the-top ornamentation and violent imagery; it was both divine and unsettling. Religious icons in and out of her home became constant reminders of morality, pain and the grotesque. In this body of work, Chavez uses texts to reveal personal confessions that imply shame. Hand-drawn images and the printed word serve as a biographical narrative, which document what she suppressed living in a conservative Catholic family. The “front” she carried became a way for her to conceal what she perceived then as a hypocritical household. “My intention is to convey the unease between purity, seduction and evil. Intricate drawings, repetition and pattern have become rituals in my process, which allude to the monotony of mundane rituals that occur in worship. Gaudy religious icons, which were once dull, have been heavily accessorized with “bling” in an attempt to make the object more interesting. They hint at the mass production of holy celebrities in order to sell faith. 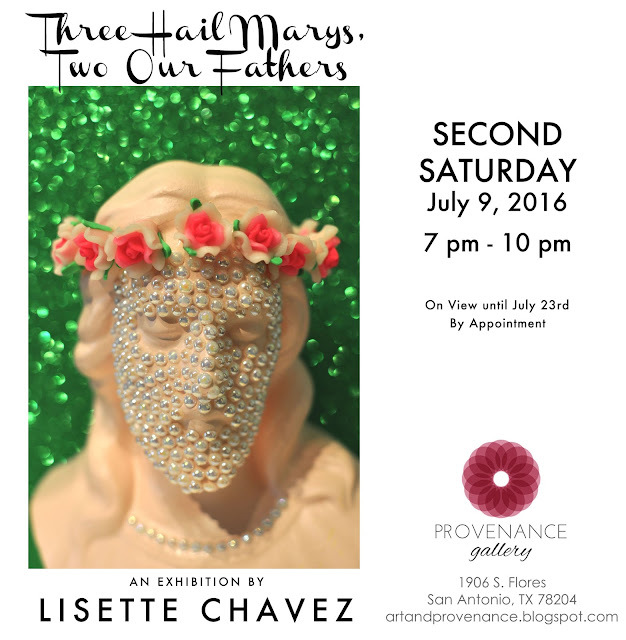 Lisette Chavez was born and raised in the Rio Grande Valley, located on the southernmost tip of Texas near the Mexican border. An enduring interest in lithography resulted from a love of drawing at an early age. Her most recent work questions faith and confronts the discomfort in balancing religious beliefs and actions in everyday life. Her work is held in numerous museum, university and private collections including: the Museum of Texas Tech University, Lubbock; Monash University, Gippsland, Australia; Proyecto Ace, Buenos Aires, Argentina; St. Lawrence University, Canton, New York and the University of Colorado-Boulder. She is currently an Artist Lab Fellow and resident of the Guadalupe Cultural Arts Center in San Antonio, Texas. Chavez is currently organizing Holy Press, a lithography workshop and residency slated to open in the Fall of 2016.